Etobicoke Marble Restoration is a family-owned and operated company specializing in the restoration and maintenance of natural stone and tile, as well as concrete and terrazzo. Our services include grinding and honing, polishing, cleaning, and sealing your natural stone surfaces, tile and grout cleaning, crack and chip repairs, stain removal, Color Sealing for stained, faded and discolored grout, and routine specialty maintenance of your stone and tile surfaces, which can prevent the need for more expensive restoration or replacement projects in the future. Marble floors and worktops are stunning additions to any home, but these exclusive and often expensive finishes are prone to wear and tear just like everything else. Damage from chemical or acidic cleaners, pets and the demands of everyday life take the shine off your surfaces. We understand just how important it is to have the right tools and experience to get the best results from cleaning and sealing your marble. We restore the natural polish and feel of your marble or stone floor by carefully cleaning the surface with our state of the art equipment and tools. Marble or stone tile floors are a statement piece and why it is imperative to investment in restoring your floors by a professional like Total Stone and Concrete Polishing. Heritage buildings have some of the best marbles in the world, and we take extreme care and pride bringing life back into 100 years worth of history for our generation and next generations to continue in witnessing and experiencing. We are experts in restoring heritage buildings due to the number of years gained within our industry. If you would like to know more about Etobicoke Marble Restoration floors and other surfaces please call 647-801-8090 or just email us through our contact page. After 15 YEARS experience with natural stone, tile, grout, paver and concrete; Etobicoke Marble Restoration is uniquely skilled to address the needs of your situation. We perform thorough material assessments and test samples before recommending a solution that ensures an end-product that meets (hopefully exceeds) your expectations. We clean, polish, repair, or restore all your natural stone surfaces. Flooring, countertops, showers, interior & exterior. TCROWN offers Etobicoke Marble Restoration a range of marble floor restoration services for the Etobicoke Ontario area including removing etch marks from marble flooring, removing lippage from marble floors, properly sealing marble floors and polishing marble. Marble floors with scratches and extremely worn areas are restored using a wet diamond grinding and honing process. A series of diamond impregnated abrasives are used to resurface the marble floor. A Penetrating Sealer which is also referred to an impregnator is then applied to provide stain resistance to the marble. The last step in refinishing is a 2 part polishing process that creates a hard, glass shine. Marble floors should be cleaned with a neutral cleaner. A neutral cleaner for marble is a cleaner that has a ph of 7. The best place to buy a neutral cleaner for your polished marble is from your marble restoration company or your local janitorial supply store. A common mistake made when cleaning marble is the use of non-neutral liquids such as vinegar and tile grout cleaners. These liquids will “etch” the marble, removing the polish. The last step in refinishing marble floors is a polishing process that creates a hard, glass shine. This polishing process is not a wax finish that yellows, scratches easily and must be stripped off and re-waxed often. The final polish used on marble flooring is scratch, scuff and UV resistant. Marble floors should be sealed with a Penetrating Sealer which is also referred to as an Impregnator. This sealer repels oil and water providing stain resistance to marble floors. A topical sealer should never be used on marble as it will hide the true beauty of your marble floors and create a covering that yellows, scratches and wears out quickly. At TCROWN we are experts at Stone restoration Etobicoke which includes enhancing new and restoring, polishing, honing and sealing existing marble and stone floors. Save time and money by avoiding getting your tiles grouted. Just call TCROWN and we will gladly come to fill the gaps with epoxy / polyresin before proceeding to grind & polish. Feel free to contact us for a quotation for any job requiring Etobicoke Stone Restoration whether it be a new or existing residential property, a large or small retail premise, a warehouse, large scale building or office tower. 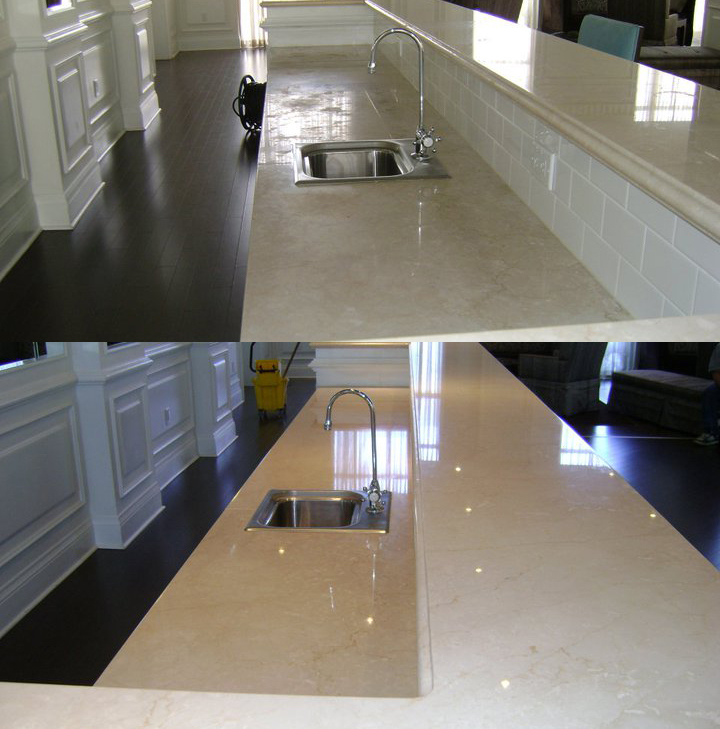 To speak to an accredited Stone Restoration Etobicoke specialist or for information and a free quotation dial 647-801-8090 or just email us through our contact page. TCROWN Stone Care serves the GTA ONTARIO area and Richmond Hill, Vaughan, Toronto, Markham, Mississauga Markham, Brampton , Ajax, Aurora, East Danforth, East Gwillimbury, East York, Etobicoke, Newmarket, Oshawa, Pickering, Scarborough, Whitby and Whitchurch-Stouffville Ontario. area and can repair, refinish, protect and restore your marble, onyx and all other natural stone back to its original condition.